Dylan made the honor roll! I share a secretary with the director of Child Services. This week is Karla’s birthday, so the three of us went out for lunch. During the school day, I try to make time to hear what’s going on with family, but we all get busy with needed projects and paperwork. It was nice to have time to sit across a table, share a meal, talk leisurely and leave work behind. A new sales rep for a company we do business with visited us for the first time. Dressed sharply in suit and tie, he stopped at a gas station in Fort Thompson, on the Crow Creek reservation. As he was pumping gas, someone there asked him “Are you a FBI agent?” Not too many other suits around these parts I guess. 5th through 8th grade held their honor roll assembly. 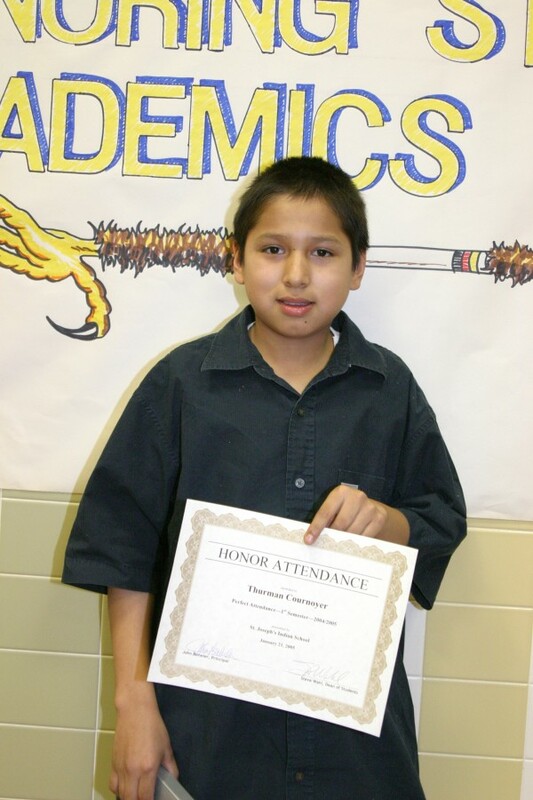 While a good number of students made the honor roll, I was surprised at how many perfect attendance awards there were. But that happens here regularly, since the students live here. The students whose families are more involved in their lives are more likely to miss days, because they may go home for weekends and not get back on time. But we have a sizeable group of students who don’t have a lot of parental involvement, and rarely get checked out. Several even stay during holidays and into the summer months. Working with those students is where I feel we most fulfill our mission. When five o’clock rolled around I felt tired. Instead of making any further rounds or taking part in evening activities, I opted for a low-key night. Stress doesn’t help in the battle against cancer, and when I feel fatigue coming on, I’ve learned to slow down. I read, prayed and exercised. When I do that I usually bounce back the next day with more energy and focus. When I push too much is when I get impatient, lose my enthusiasm and creativity, or have other difficulties. Father Steve..We can’t imagine YOU getting impatient..or losing your creativity..or enthusiasm…! THAT would be a sight to behold..! Anyhow..you did have another big day..and a GOOD one..! But if you EVER feel like having a REAL BIG SNIT..let us know..THAT would be the hottest ticket in town..!…It would be worth our airline tickets to get there to see it..! Keep your kewl..The BEST is yet to come..!